There are many kinds of part-time jobs in Japan. Many Japanese university students work part-time jobs because many of them live alone and they have to make money for their everyday life. Unfortunately, however, some jobs in Japan are so bad for students that they are often called “black kigyou”. Naturally, that the most important thing for students is not the job but their education, so they should get a good one. I worked at a cram school for 6 months last year and it was a kind of “black kigyou”. This project will help students of universities who are starting their very first part time job. As such, I will mention some helpful information in deciding a part-time job based on my experiences. When you decide your part-time job, understanding your needs and lifestyle will help you get the best job to you. First, if your focus is just making money and you want to earn it a lot, you had better get a job whose payment is high. Some friends of mine work at Hamazushi which is located in Asahimachi. Its pays 930 yen per hour and this is relatively good in Japan, so it is a good job if you want to make much money. However, some jobs pay well, because they make you work very hard or are strict, so you should pay attention to that. Second, it is also important to think about whether you can work when you want to or not. If you are a member of a club of your university, you have to think about the days you can work because you cannot work when there is the club activity. In some part-time jobs, you can work as much as you like and also can change your shifts freely when you have something you have to do at that time. In contrast, the other jobs are very bad for you in deciding shifts. Your boss might say something like “You must work on this day. There is no one else who can work on the day, so I need you to come in”. How do you find out if a potential employer is a “black kigyou”? The easiest way to find a “black kigyou” is to ask your friends who work at the company. Then, you can decide if the job is good for you or not. I think, however, that this method is not enough to figure out whether the job will be good for you. When you hear that a job is good based on hearing the story from your friends, you should search for more information about the job on the internet or from the advertisement. I mentioned some ways to avoid a “black kigyou”, but if you get a bad job, what should you do? The most important thing is to tell your boss that you quit the job. Generally speaking, you have to inform that you want to quit the job more than 2 months before the month in which you want to quit. You can legally quit the job if you do that. If your boss say “You mustn’t quit” or things like that, it is probably a “black kigyou” because companies in Japan don’t have right to force employees to keep working. It is important to inform that you want to quit the job as soon as you have decided to quit. If you cannot quit the job because of the boss’s judgment, you can take a counsel with Hello Work. (Asahikawa has that.). They can give you some helpful advice. As I mentioned above, I worked at a cram school for 6 months and it was bad for me for some reasons. First, my boss was so crazy! One day he said to me “Quit your club and focus on the work! Club activities are just your hobby, right?” I didn’t understand his idea and that made up my mind to quit the job. Second, I had to go to far places like Takikawa by train. It was like a long journey and it made me very tired. Working at that cram school wasn’t suitable to busy students. In addition, I had a small interview with Taiga, who is a GEL students and worked at UNIQLO in Asahimachi. He also said it was a “black kigyou”. He said that the worst thing about the workplace was that there are very few employees. In particular, there are just 3 employees who could work the cash register including him. This is how he had to work much more than other employees. For this reason, the number of employees is also important thing to consider in choosing a part-time job. I think that the environment of the workplace is the most important when you do a part-time job because if you just focus on the payment, you cannot spend a good school life. There are many part-time jobs in Japan, so you will definitely have difficulty in choosing a good one. However, don’t be afraid. If you carefully think about your needs and which job is the most suitable to you, you will absolutely get a great one. Part-time jobs are very important part of your school life. Find the best one! In my last post, I explained how to apply to and get your passport. In this post, I explain how to apply for TOEFL (basically, you need your passport to apply). Next, let’s look at how to make an application for TOEFL. First of all, go to the web site of TOEFL (https://www.ets.org/jp/toefl). Then, create your TOEFL account and access to your account page. There is “Test Registration and Orders” at left side on your page. Click it and apply for a test following the instruction. You have to pay for the test fee by a credit card. If you don’t have one, ask one of your friends or professors who has a credit card to pay for the fee. To make it easier for you to understand, I will also explain these procedures in Japanese. In this project, I will tell you how to apply for TOEFL (The Test of English as a Foreign Language). TOEFL is an essential to studying abroad because almost all foreign universities require students to take TOEFL. To take TOEFL, you must first get your own passport, because you have to bring it when taking TOEFL for an identification. Let’s check “a passport application process checklist” below. 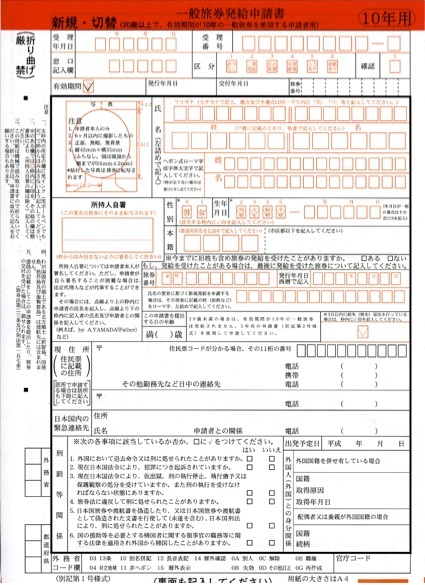 A form to apply for a passport (you can get it at a passport center). (2) Go to a passport center. NOTE: The passport centers you can go to depends on your resident registration. For example, if you are a citizen of Asahikawa, you must go to a passport center in Asahikawa. In most cities, you can do this at City Hall. 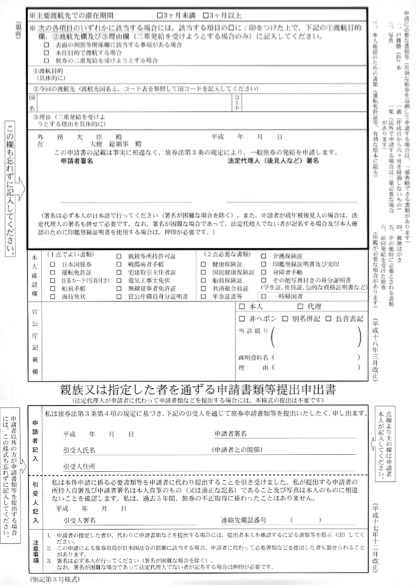 This means if registered residence is in Kushiro, you cannot go to Asahikawa’s city hall (Incidentally, my resident registration was in Sapporo, so I had to go to a passport center in Sapporo). Also, any Japanese citizen can get their passport from any Sinkoukyoku or the Hokaido Passport Center in Sapporo for applying. These options don’t depend on your resident registration. (In Asahikawa, the nearest place that anyone can go to is the Kamikawa Shinkoukyoku (it’s technically in Asahikawa)). (4) Bring the form with things which I showed in (1) to a staff member. Basically, you can receive your passport a week after applying for it. To get your passport, you have to pay. For people who are 12 years of age or older, it costs 11,000 yen to get a 5-year passport. For people who are 20 or older, you can pay 16,000 yen to get a 10-year passport. There are two pictures of the forms below. This post is a place for 2期生 who have been in the program for just two months to give advice about what they think future GEL students should do. Should they get part time jobs? Should they study hard? What classes do you recommend? What advice would you give to next year’s freshmen who join GEL? January 7, 2016 / 6 Comments on What advice would you give to next year’s freshmen who join GEL? Right now, the current GEL freshmen are nearing the end of their freshman year. You will soon be sophomores which makes you sempai to the new incoming class. Now, that you are older and wiser, what advice would you give about how they could spend their freshman year well? Would you tell them that they should copy you? Should they get a part-time job? Who should they talk to to get the best advice? How should they study English? What major should they pick? Do you have any regrets about the year? Did you have any great experiences that you think they should know about? Do you have any warnings for them? Explain why you think what you think in your comments. (We will do this one during class).